Dethatching your lawn improves its overall health. When you dethatch, you actually cut through the thatch with knife-like blades and then removing the debris. It is a combinglike operation in which you comb out the debris. 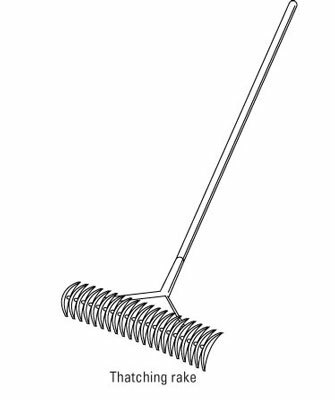 You can buy what’s called a thatching rake, which has knifelike blades rather than normal tines. You vigorously rake the lawn to remove the thatch, but it’s hard work and practical only for small lawns. The more practical and effective method is to rent a gas-powered machine called a dethatcher, vertical mower, or power rake. Available at your local rental yard, a dethatcher cuts through the thatch with rotating blades or stiff wire tines. The machines can be fairly heavy and a bit difficult to maneuver, but they’re a lot easier to use than thatching rakes. 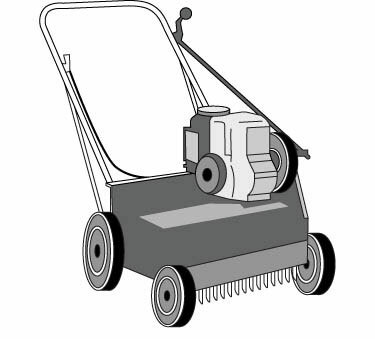 For thick grasses like Bermuda grass and zoysia grass, use a vertical mower with steel blades. You can use the wire-tine type of dethatcher on Kentucky bluegrass or fescue lawns. Mow the lawn a little lower than normal right before you dethatch. Make at least two passes over the lawn with the dethatcher to get all the thatch. Make the second pass at a 90-degree angle to the first. Rake up all the debris. If you haven’t used any pesticides on the lawn and it’s not a weedy grass like Bermuda grass, you can compost the debris or use it for mulch. Water and fertilize the lawn (according to your soil test results). Dethatching is pretty stressful on a lawn, and it can be on you, too. The lawn ends up looking pretty ratty, but if you dethatch at the right time, the lawn recovers quickly and fills in. For a quicker fill-in, some people prefer to reseed the lawn right after dethatching. You simply spread the seed, rake the lawn so the seed gets down to the soil surface, cover with a light mulch, rake lightly again, and keep everything moist. If you don’t want to reseed but worry that weed seedlings may take over before the grass recovers, apply a pre-emergent herbicide (it prevents weed seeds from germinating) after dethatching.